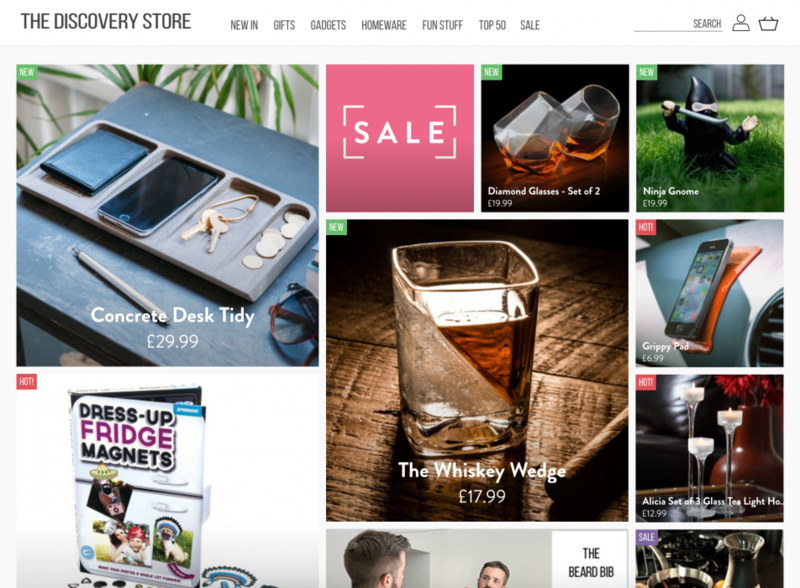 The Discovery Store is a gadgets and gifts retailer based in the UK, focused on bringing customers the latest and most imaginative products on the market from quirky home decor to remote control robots. Our primary task was to replatform The Discovery Store from their previous eTail system across to Magento Open Source. The older iteration of thediscoverystore.co.uk was not responsive and provided a poor user experience. It also threw up a variety of challenges when attempting to change content, add banners, and introduce promotions. As a result, as part of the replatform, we were looking to improve the overall customer experience through a variety of methods, with an all-new fully responsive design a component of this. One of the most significant sections of this project was the total revamp of site structure and content, with improved fluid search capabilities to complement it. Navigation recieved a total overhaul, based on extensive keyword research, and a fantastic responsive design was implemented that radically altered the look and feel of The Discovery Store site. Using Google’s Keyword Planner, we looked to identify the optimum keyword for all of The Discovery Store’s categories and products. Our detailed research allowed the client to make informed decisions about the ways in which their products and categories were titled, and, in identifying several very specific long-tailed keywords, also allowed us to devise a brand new secondary menu structure that used customer archetypes to further refine products on the site. All of the product content was rewritten, along with meta titles, descriptions and correct implementation of simple/conﬁgurable products with canonical tags pointing to the parents. We used layered navigation to create ‘personalities’ for longer tail keywords and wrote a custom extension. Many of the improvements that we made also resulted in a significant improvement to visitor interaction rates across the board, and a slight improvement to the number of products sold per-transaction.Now that we’re managing The Discovery Sotre’s SEO marketing campaign, we would expect continued growth in all areas, and we’re very excited to see what the next six months has in store for one of our favourite clients.